Student record and qualification could be authenticated online by students’ diplomas and ID information, based on web page or web service. Students could also check their own information for free through real-name registration. Based on online verification, report on student records, qualification certificates, and admission information can be provided for the use of employment, overseas study, further studies, promotion, professional titles evaluation and credit assessment. Both Chinese and English versions for higher education qualification certificates, student records, and student’s academic transcripts, high school qualifications, and Gaokao scores,which are awarded at any time, can be provided. 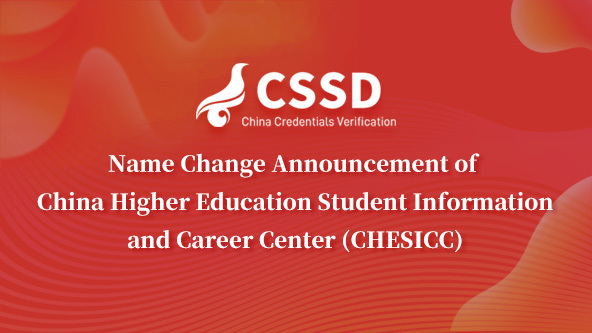 This website CHSI is maintained by CHESICC (China Higher Education Student Information and Career Center), the MOE-authorized qualification verification institution in China. We offer digital administration and services for student enrollment, student record and qualification management, employment information, military conscription, etc. Our credential verification service includes postsecondary student record, qualification certificate, college transcript, high school diploma, and Gaokao scores, etc.